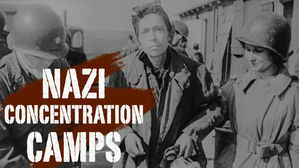 On conditions found in Nazi concentration camps in Germany and Belgium by advancing Allied Armies during World War II. Consists primarily of dead and surviving prisoners and of facilities used to kill and torture. Map of Europe shows locations of various camps. At Leipsig Concentration Camp, piles of dead bodies, and many living Russian, Czechoslovakian, Polish and French prisoners. U.S. Red Cross workers move them to German Air Force hospital where their former captors are forced to care for them.